Columbia-HTC's Mark Cavendish got schooled on Thursday, with Thor Hushovd launching a long solo attack that netted 12 points in the green jersey competition. Hushovd looked to be reacting to comments from Cavendish that a Hushovd green jersey would be stained after Cavendish was relegated back in Stage 14. Saturday, Cavendish responded, as his squad shepherded their sprint ace over the day's biggest climb, the 2nd Category Col de l'Escrinet, despite losing Michael Rogers and Mark Renshaw to the fast finishing pace. Cavendish launched his sprint from a long way out, but held off Hushovd and Gerald Ciolek all the way to the line, to take his 5th stage of the 2009 Tour. No sprinter has won 5 Tour stages since Freddy Maertens in 1981, and Cavendish still has a chance in Sunday's Stage 21 to the Champs-Elysees in Paris. Cavendish also becomes the all-time British leader in stage wins, surpassing Barry Hoban with his 9th career stage win in just two Tour starts. The day started like a typical transitional stage, with a large group of strong riders away, including Yaroslav Popovych, David Millar, Cadel Evans, José Gutierrez, Leonardo Duque, and 15 others. Rabobank did most of the chasing, since they were one of the teams absent in the break, and first 5 riders, then just Leonardo Duque, would escape the break in an attempt to stay clear of the peloton, riding way ahead of the projected arrival times along the route. On the day's final climb, the Col de l'Escrinet, Laurent Lefevre launched from very low on the climb, and was matched by world champion Alessandro Ballan, who would survive until the final 2 kilometers, before being reeled in by the surviving 3 Columbia-HTC riders, trying to set up Cavendish, who survived the climb, shadowed by Hushovd. Hushovd's 2nd place finish limits the damage to his green jersey lead, where he leads Cavendish now 260-235, with 35 points to the winner in Paris on Sunday. 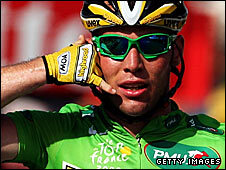 Even if Cavendish wins there, Hushovd will be safe in green if he can finish in the first 10 or 15 riders at the finish. Lance Armstrong was attentive at the finish, and picked up 4 seconds when a gap formed in the field, with Klöden, Wiggins, both Schlecks, and Contador on the wrong side. It's unlikely that 4 seconds will make a difference, but it points up how Armstrong rides this race, always aware of every chance to make or lose time. Ever since the Giro d'Italia in May, there have been rumors about a new U.S. based team, apparently to feature and be owned by Lance Armstrong and to be run by Johann Bruyneel. In June, Joe Lindsey ran a story on Bicycling.com detailing contingency plans he said were in place for an Astana financial meltdown, which was narrowly avoided when Kazakh and US sponsors came up with $6 million to guarantee support through the end of this season. Lindsey said the team would have been called the “Livestrong-Nike” team. Just before the Tour, Alexandre Vinokourov had a press conference, where he reminded everyone that Astana was a team built around him, and that he intended to return to the team when his suspension ended July 24th (tomorrow). Speculation immediately returned to “Livestrong-Nike,” but reporters who had talked to Armstrong's management team said that wouldn't be it, apparently with the knowledge that the new sponsor is to be a Ft. Worth, TX-based company. This morning, Bonnie D. Ford of ESPN tweeted that someone in Capital Sports and Entertainment registered “teamradioshack.com" this week. CSE is Armstrong's management team, overseen by Bill Stapleton and Bart Knaggs, and ran the Discovery Channel team. I've verified the domain registration to CSE Cycling, LLC, and that it was set up on Monday. Currently, www.teamradioshack.com brings up only a default Apache web server page. The official announcement is reportedly set for noon Eastern. The team website, Twitter ID (@teamradioshack), and Facebook page are up. Livestrong.com has a video by Armstrong announcing the team, while Radio Shack offers a standard press release. Note that no other riders have been officially announced for the team, nor has Bruyneel been officially named the DS. Stage 17 is one that will be remembered for three things: The Schleck brothers finishing together with race leader Alberto Contador more than 2 minutes clear of the field, Thor Hushovd going out on an audacious solo Alpine attack to grab the green jersey by the throat, and a probing attack by Contador late on the stage that triggered an absolute Twit-storm. Mark Cavendish has criticized Hushovd, who protested the Stage 14 finish, leading to a Cavendish relegation for irregular sprinting. This is nothing unusual -- Hushovd lost the jersey in 2006 partially as a result of a relegation in Stage 4, and won the jersey in 2005 partially due to Robbie McEwen's relegation in Stage X. Cavendish, who features in a Nike campaign that declares “green is my yellow,” said the green jersey would be stained if Hushovd won it through Cav's relegation. So Hushovd set off on a little jersey-cleaning mission, attacking with Thomas Voeckler over the top of the Col de Roselend to join an early break, then setting off solo over the Col des Saisies and the Côte d'Araches, more than 70k alone, while Cavendish was getting unhitched from the back of the field. With the 12 points collected, Hushovd moves 30 points clear in the green jersey competition, with 35 available in Paris on Sunday. I wouldn't be surprised to see Hushovd off the front again on Friday. The end of Hushovd, early on the Col de Romme, was the end of the break as well, with Saxo Bank stringing out the field for the inevitable attack by Frank and Andy Schleck. Carlos Sastre was the first to attack, but was soon reeled in, with Andy Schleck still sitting near the back of the GC group. When Frank Schleck attacked, he was quickly joined by Armstrong, Wiggins, Contador, and Andy Schleck, who attacked again, gapping Wiggins, Vande Velde, Armstrong and Frank Schleck. When Schleck launched a bridge move, Armstrong and Wiggins followed. Andy Schleck pushed the pace again, and Wiggins was gapped, with Armstrong alongside. Once again, Frank Schleck jumped the gap, this time alone. The lead group on the road was Contador and Klöden for Astana, and the Schleck brothers for Saxo Bank. Behind, Christian Vande Velde fought back up to Wiggins, Nibali, and Armstrong, setting pace for several kilometers, but slowly losing ground to the fearsome foursome up front, before Vande Velde fell away. With the gap to Wiggins, Armstrong, and Nibali over 2:00, and 2k to climb on the day's final climb, Contador launched an attack. Klöden, who had been sitting on the back of the group for several kilometers, didn't have the legs to match, and was suddenly 20 seconds back. Contador came off the attack, and spent the rest of the climb looking back for Klöden. The Schlecks covered and pushed the pace enough to guarantee Klöden wasn't coming back. Meanwhile, Armstrong was on full boil, 5th on the road, riding hard toward Klöden, and towing Vincenzo Nibali of Liquigas. They would catch Klöden near the finish, with Nibali taking 4th on the stage. Lance Armstrong looked exhausted at the end of Sunday's Stage 15. After his teammate Alberto Contador launched what would be a winning attack, Armstrong couldn't follow attacks through the gap by Wiggins, Nibali, Sastre, or Evans, and finished 9th at 1:35, hanging onto 2nd place, but by a bare 9 seconds. What a difference a (rest) day makes! On today's Stage 16, when Andy Schleck went off the front, Armstrong was again dropped, this time by teammates Contador and Andreas Klöden, the Schleck brothers, Bradley Wiggins of Garmin-Slipstream, and Vincenzo Nibali of Liquigas. Armstrong rode within himself, and found shelter briefly in a group of GC hopes, including Vande Velde, Sastre, Evans, and Kreuziger. With a little less than 5k to ride, Armstrong launched a very 2003-era Armstrong attack. Kim Kirchen and Christian Vande Velde briefly tried to follow, but couldn't. When he flew by Frank Schleck, Schleck gave it just about one second's thought before he thought better of it. With Armstrong back alongside Contador, Astana had 3 riders in a 6-man group, and once again, they were content to conserve energy and wait for Schleck or Nibali (or Wiggins, but he doesn't really need the time) to attack, but neither wanted to take on Contador, Armstrong, and Klöden. At the lower pace, all the GC candidates but Cadel Evans rejoined, and then coordinated to put serious time into Evans. Astana continues to ride a very smart race, running out the clock for the climbing specialists, with just two big Alpine climbing stages left. Attacks went straight off the gun, and Astana was happy to let most of them go. King of the Mountains apirants Franco Pellizotti and Egoi Martinez, Jens Voigt, Fabian Cancellara, José Ivan Gutierrez, Vladimir Karpets, and about a dozen others all went clear. On the climb to the Col du Grand-Saint-Bernard, the breakaway group was 16 strong until Franco Pellizotti attacked. He was matched by Vladimir Karpets, and briefly by Egoi Martinez, who didn't look ready to concede the polka-dot jersey to Pellizotti. At least, at first. With a few k to the summit, Martinez was dropped, and rejoined the big chase group. Two surprises at the back of the pack early in the day were Columbia-HTC's Tony Martin and current white jersey Andy Schleck of Saxo Bank. Fedrigo has declared his intention to ride for the KoM jersey. The leaders gained time on the descent, with Karpets riding to gain GC time. He started Stage 16 5:56 behind Contador and the break was out beyond 4:00 as the pair led the race across the valley floor. At the day's first intermediate sprint, the leaders didn't even break rhythm, with Pellizotti leading Karpets across. After the feed zone, Karpets and Pellizotti eased their efforts, and drifted back into the chase group, which then included Pellizotti, Karpets, Voigt, Roche, Casar, Fedrigo, Ten Dam, Van Den Broeck, Astarloza, Anton, Velits, Vogondy, Trofimov, Goubert, Laurent Lefevre, Verdugo, and Jose Angel Gomez Marchante. Back in the field, Andy Schleck moved to the head of the field after a puncture. Soon after the final climb began, the lead group began to splinter, with teammates Trofimov, Lefevre, and Fedrigo setting the pace and Silence-Lotto's Jurgen Van Den Broeck covering every attack. When Pellizotti finally went for broke, only Van Den Broeck could match his initial acceleration, and Moinard and Gomez Marchante set out in pursuit. Nicki and Chris-Anker Sørensen were meanwhile whittling the GC group down to only the strongest riders. When Chris-Anker Sørensen was done, Andy Schleck launched a tremendous acceleration, paced only by Contador, Wiggins, Klöden, Nibali, and Fränk Schleck. With Armstrong, Evans, Kreuziger and Sastre together and falling away, the Schlecks pushed the pace. With 4k to the summit, Pellizotti and Van Den Broeck still rode together, but Mikel Astarloza slowly crossed the gap, followed by Moinard. Armstrong, riding alongside Christian Vande Velde, Cadel Evans, Carlos Sastre, and Roman Kreuziger, then launched an explosive attack. First Kirchen, then Vande Velde, tried to grab his rear wheel, but neither could hold on. Soon, he would ride past Frank Schleck, now suffering and falling off the back of his brother's group. Armstrong rejoined Contador's group at almost the same time that Schleck caught Jens Voigt, and Voigt took over on the front. The group swelled with a combination of early breakaway riders like Laurens Ten Dam, and riders catching up from behind as the pace moderated, including Sastre, Vande Velde and David Zabriskie, but not including Cadel Evans, who labored 2+ minutes back down the road. On the descent toward the finish, Jens Voigt took a very hard fall, possibly because of an equipment failure, and went down very hard on his right side. He was taken directly to the hospital, and an update is expected this afternoon, US time. David Zabriskie went to the front and led the field through almost the entire 30k descent, nibbling steadily away at the leaders. A chase group, including Nicolas Roche, Stephane Goubert, Sandy Casar, and Pierrick Fedrigo, was also gaining on the stage leaders. Moinard was the first to try to escape the lead group with less than 4k to go, with the chasing foursome driving just behind. As Moinard was caught (by Van Den Broeck), Euskaltel-Euskadi's Mikel Astarloza, a pro who has never won a one-day race or a stage in his entire career, made his move. With less than 2k to ride, and the groups coming together, Astarloza's move was perfectly timed, and he would TT to the finish, coming around the final bend with the chasing riders clearly visible behind. Sandy Casar would take the sprint from the bunch for his 6th career 2nd-place in Tour stages. The yellow jersey group, now including everyone who mattered but Evans, would finish at :59, with Contador sprinting to the line just behind Christophe Moreau. Alberto Contador showed why he's the dominant stage racer of the moment on the climb to Verbier Sunday. On the day's final climb, Saxo Bank and Garmin came to the front and Saxo Bank took charge. Jens Voigt did a withering 1.5 kilometers, forcing a major selection and putting the yellow jersey of Rinaldo Nocentini in jeopardy. When Voigt was caught, Fränk Schleck came to the front, but soon after, the contenders reached Saxo Bank's Fabian Cancellara, part of the day's breakaway, and Cancellara pulled so strongly that he briefly shattered the GC group, dispatching Nocentini. When he was done, he was really done, and there were only 5 men left standing: The Schleck brothers, Astana's Cane and Abel Lance Armstrong and Alberto Contador, and Bradley Wiggins. That's what I said, Bradley Wiggins. After a couple of quick feints, Contador did his thing, almost instantly putting 10-15 seconds into the chasers. Andy Schleck set out in pursuit, while Armstrong tended Wiggins and Fränk Schleck. As Contador pushed his lead, some of the other GC hopefuls started to come back onto the Armstrong group, including Cadel Evans, Christian Vande Velde, Andreas Klöden, Vincenzo Nibali and Roman Kreuziger. Noticeably absent was Carlos Sastre, who was riding at his own pace well behind the leaders. Vande Velde struggled at the rear of this elite group, and as he fell off, he was passed by none other than Carlos Sastre! Sastre, looking recovered now, bridged up to Armstrong's group. By now, Contador had :45 on the Armstrong group, and Bradley Wiggins was the first to try to join Andy Schleck up the road. Frank Schleck bridged, matched by the rest of the Armstrong group, then attacked toward his brother. Contador was getting a little too much love from some of the fans, and swatted at them with about 2.5 kilometers to ride. Wiggins was still feeling strong, and attacked out of the Armstrong group, with Nibali on his wheel. When they caught Frank Schleck, the three rode together, with Wiggins (Wiggins!) doing the majority of the work. Sastre then attacked out of the Armstrong group, and Evans, who later said it was his worst day ever on the Tour de France, followed, leaving Klöden and Armstrong behind. Sastre would catch what protocol demands I call “the Wiggins group” in the final k, but nobody was going to pull back significant time on Contador on today's course. He would cross the finish line in 5:03:58, enough to put him more than 90 seconds clear in the overall. As the stage winner, he also won a Saint Bernard. Afterward, Lance Armstrong said Contador had shown he was the strongest rider in the race, and that Armstrong and Klöden would ride in support of Contador for the rest of the Tour. 6) Carlos Sastre, Cervelo Test Team, s.t. 2007 green jersey Tom Boonen withdrew from the Tour today, with only poor placings in this year's Tour and only one likely sprint stage (Stage 21 next Sunday) remaining. Boonen, the 2005 world champion, has been seen off the back of the field for mechanicals more this year than he's been seen in the front of the field preparing for the sprint. His best finish was 16th in Stage 11. The reigning Belgian champion, Boonen announced yesterday that he would ride the Vuelta a España in September. A lot has been said about the use of social media in this year's Tour de France, but today we really saw it in action. I happened to wake up at about 4:30 a.m., and checked in on my Twitter stream on the iPhone. I saw several tweets about Levi Leipheimer's wrist fracture, including one about 15 minutes old from Lance Armstrong, with a picture of Leipheimer in his cast. Then, during the stage today, Leipheimer was actually Twittering from the operating room, including photos of the man himself on the operating room table, of the preparation of his wrist, and of the final X-ray, showing his 22mm titanium screw in place. Here's a screen shot of the whole exchange. All of this was straight from the riders involved, and within minutes of it actually happening. It's a brave new world, kids. In the words of the immortal Tom T. Hall, I love winners when they cry. Cervelo Test Team's Heinrich Haussler is 25, and an up-and-coming star. He took Stage 2 at Paris-Nice this year, and was surprised by Mark Cavendish in the last 100 meters, taking 2nd at Milan-San Remo. A lot of pundits had suggested that Cervelo should consider letting Thor Hushovd lead out Haussler, instead of the other way around, but tonight, Cervelo looks pretty smart indeed. Haussler went in one of the day's first breaks, just 3k out of the blocks, with Christophe Moreau, Jens Voigt, Juan-Manuel Garate, Ruben Perez, Sylvain Chavanel, and Rigoberto Uran, but Garate was highly enough placed that the field wouldn't let him go, so Haussler, Perez, and Chavanel took off after about 60k ridden. The peloton was happy to let these three go, and the lead kept growing out to around 7:30 with about 85 kilometers ridden. On the day's first climb, Egoi Martinez was able to just nip Franco Pellizotti for KoM points, but on the Platzerwasel Martinez was dropped and Liquigas' Pellizotti would come off the front as the field reached each summit to pick up a few KoM points. The three men up the road prevented Thor Hushovd from doing likewise in the intermediate sprints. Amets Txurruka and Brice Feillu attacked out of the field, gradually closing on the leaders, but Haussler was not going to be caught on this stage, about 30 kilometers from his home. Behind, Chavanel just ran out of gas, and was caught by Txurruka, then Feillu as the riders approached Colmar. As Haussler came to the line for his first Tour stage win, he was in tears. Haussler's teammate Thor Hushovd finally could take advantage of Mark Cavendish, riding in the autobus, on the field sprint, but was nicked at the line by Peter Velits of Team Milram. Still, the 15 points for 6th catapulted Hushovd back into the green jersey for tomorrow. 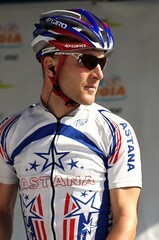 7) Vladimir Efmikin, AG2R, s.t. 8) Bradley Wiggins, Garmin-Slipstream, s.t. 9) George Hincapie, Columbia-HTC, s.t. 10) Andy Schleck, Saxo Bank, s.t. Thanks to Fritz at Cyclelicious, who turned me on to PicApp, a new service to use editorial art on your weblog. That's the provider for the Haussler picture above; you can click on the Gallery button to go to a Stage 13 gallery from Getty Images and others. Saxo Bank's Nicki Sørensen used his head and his legs to outfox 7 breakaway compatriots and take Stage 12 of the 2009 Tour de France. The breakaway that mattered featured Sørensen, Sylvain Calzati of Agritubel, Milram's Marcus Fothen, Franco Pellizotti of Liquigas, Laurent Lefevre of Bbox Bouygues Telecom, Egoi Martinez of Euskaltel-Euskadi, and Remi Pauriol of Cofidis. Each rider took out one team for chase purposes, and it soon became apparent that Columbia-HTC, which has been chasing breaks to set up Mark Cavendish, had no interest today, so the pool of riders to drive the capture was pretty small, and never brought the gap inside of about 3:30. With 22.5k to ride, Sørensen decided he didn't like his chances against his breakmates, attacked, and was joined by Calzati. The pair rotated smoothly and built a gap of almost 20 seconds, but the 5 behind slowly closed the split. Nearly caught with around 5.5k to ride, Sørensen turned his guts absolutely inside out, dropping Calzati, and briefly throwing the chase into disarray. Within a kilometer by himself, he had built a 22-second lead, which he stretched to 34 seconds with 1k to ride. At that point, it was a done deal, and Sørensen saluted the crowd as he crossed the line with a victory for the often-unheralded “pack fodder” of the Tour. Sørensen's primary role for Saxo Bank at the Tour was expected to be taking long pulls on the front of the peloton, hunting down breaks to protect Andy Schleck's race lead. Today, he took a turn as the hunted, and took home the stage win. With no General Classification risks being taken, the green and polka-dot jerseys each took a turn in the limelight today, with Cavendish and Hushovd going head to head at the day's 1st intermediate sprint, won by Cavendish, and in the field sprint, led out by Cervelo, but still won by Cavendish. Cavendish had been reluctant to name the green jersey as a goal here, but if he's chasing intermediate points, there's no doubt. Pellizotti and Martinez engaged in a few rounds of sprint the mini-mountains, with Pellizotti getting the upper hand, and moving within 18 points of Martinez in the competition. It's still very possible that someone else entirely takes the climber's jersey with a long Alpine escape, but it looks like Pellizotti and Martinez plan to cover those moves. Levi Leipheimer was involved in a late crash that also claimed Michael Rogers and Cadel Evans, but all three continued. Leipheimer was banged and scraped up, and should be able to continue, but there could be lingering effects as the Tour heads to the Vosges tomorrow. The course profile for today's stage looks a lot like yesterday's. It's 2.5 kms shorter, with 2 instead of 3 4th Category climbs, but it definitely looks like a stage for the sprinters. A slight uphill finish might take some of the snap out of Mark Cavendish's finishing kick, favoring Thor Hushovd, Heinrich Haussler, or Oscar Freire, but it may take more than simple physics to stop the Cav-alanche. Only Kurt-Asle Arvesen didn't make the start this morning, so 170 riders rolled out of Vatan. Race officials voided a 15-second gap that was charged in the finish yesterday, when a small break appeared in the field. The gap had dropped Levi Leipheimer and Brad Wiggins down the standings a bit, but they've been awarded the same time as Cavendish for yesterday now. Only two riders in today's break -- Johan Van Summeren of Silence-Lotto and Marcin Sapa of Lampre. They've taken the day's first two intermediate sprints and the first categorized climb of the day. Martinez led the field through to pad his King of the Mountains lead by a point. Christian Vande Velde was involved in a crash early this morning, but there have been no signs of lasting effects. Ryder Hesjedal was the 2nd Garmin-Slipstream rider to find the pavement today. He appeared to rejoin the field with no problems. AG2R's Vladimir Efimkin has been with the race doctor with scrapes to his cheek and chin from another crash today. On the day's last climb, Egoi Martinez again came to the front, but Franco Pellizotti sprinted to the KoM point to deny him the cheap point. The terrific (if Flash-heavy) new Saxo Bank site offers a post-stage interview with Norwegian champion Kurt-Asle Arvesen, who broke his collarbone in today's action, but finished the stage. His exit leaves Andy Schleck one rider down in the upcoming Alps. Arvesen won Stage 11 of last year's Tour into Foix. Arvesen is scheduled for surgery on Thursday. Mark Cavendish continued his dominance of the Tour's sprint stages, taking his third victory in three contested sprints this year. The expected Bastille Day breakaway featured three French riders: Samuel Dumoulin of Cofidis, who never met a break he didn't like, Benoit Vaugrenard of Française des Jeux, and Thierry Hupond of the “little wildcard who could” Skil-Shimano squad, plus Katusha's Mikhail Ignatiev. With radios banned for the stage, the peloton never let the break get more than about 4 minutes up the road, and made the catch with less than 2 kilometers to ride, after a day raced at touring club speeds, as things picked up for the finish. Garmin-Slipstream tried to disrupt the Columbia-HTC train, with Julian Dean squeezing in on the day's last right-hander, but Mark Renshaw led Cavendish in, and Thor Hushovd, perfectly positioned on Cavendish's rear wheel, never closed the gap to the Manxman. Garmin-Slipstream's Tyler Farrar was 3rd on the stage. A break in the field cost quite a few riders 15 seconds in the overall. No changes to jerseys (Cavendish is now down only 6 in the green jersey hunt), while Hupond was “most aggressive rider” on the “least aggressive Tour stage” of recent memory. Cavendish can equal his stage win total from last year's Tour with a win in Stage 11 tomorrow, which would also tie him with Barry Hoban for most career Tour wins by a Brit. Hoban won his stages over 8 Tours, the last in 1975. Cavendish is in only his 2nd Tour. 3) Tyler Farrar, Garmin-Slipstream, s.t. 4) Leonardo Duque, Cofidis, s.t. 5) Jose Rojas, Caisse d'Epargne, s.t. 6) Lloyd Mondory, AG2R-La Mondiale, s.t. 7) Kenny Van Hummel, Skil-Shimano, s.t. 8) William Bonnet, Bbox Bouygues Telecom, s.t. 9) Daniele Bennati, Liquigas, s.t. 10) Said Haddou, Bbox Bouygues Telecom, s.t. Back to relatively flat roads over 194.5 k or 120.9 miles today. The radio ban protest came to nothing, and riders started as expected. It's almost a tradition that a French-flavored breakaway forms on Bastille Day, but Team Columbia may very well spoil the party. They've got their sights set on the green jersey, and today looks like a stage that sets up well for Mark Cavendish, so today's drama is likely to center on whether Columbia can make the capture without radio assistance, and whether Cavendish can make it three stage wins in this Tour. Over at Wired's Geek Dad weblog, Jonathan Liu, reviews Leader 1, a game published in 2001 that simulates bike racing on a reconfigurable “Game of Life”-style track. The road segments can be rearranged to set up different race courses, including a track finish in a velodrome, with the color beside the road denoting the slope of the that part of the course. The game puts you in control of up to 3 riders, and you have to use the energy levels of your team to put one of your riders across the line first. BoardGameGeek | Leader 1 - Including details on the “Leader 2” variant, with new rules to make the game more realistic. There's also a Leader 3 variant with doping controls. I kid you not. The Belgium Sporza network had cameras on the plane flying half the Tour riders to Limoges this afternoon. The commentators are speaking Flemish, but they turn their cameras on Johan Bruyneel and Lance Armstrong, then Levi Leipheimer, then Dave Zabriskie, all of whom are speaking English, so you don't need to speak Flemish to enjoy their comments. Seven-time Tour de France champion Lance Armstrong told French television on Sunday that the current Tour is “probably not” the last we'll see of him in the Tour. “Maybe one more Tour,” he said. The Associated Press article mentions hints that Armstrong might launch his own team for the 2010 season. Pierrick Fedrigo outkicked Franco Pellizotti in the last 200 meters in Tarbes to take Stage 9 of the Tour de France. Fedrigo and Pellizotti were all that remained from a big breakaway that had swelled to 9 riders, including Jens Voigt, Egoi Martinez, David Moncoutie, and others. The pair were well clear at the summit of the Col du Tourmalet, but a chase by Columbia-HTC, then by Caisse d'Epargne and Rabobank, pulled back all but 34 seconds of their lead by the line. Yellow jersey Rinaldo Nocentini had no problems with the pace, and will hold the yellow jersey through tomorrow's rest day and Tuesday's Stage 10. New King of the Mountains Brice Feillu, on the other hand, lost his polka-dots to Egoi Martinez, who was 5th on the Col d'Aspin and 7th over the Tourmalet. 5) Peter Velits, Team Milram, s.t. 6) Jose Rojas, Caisse d'Epargne, s.t. 7) Greg Van Avermaet, Silence-Lotto, s.t. 8) Geoffroy Lequatre, Agritubel, s.t. 9) Alessandro Ballan, Lampre, s.t. It was a very active start today, as a big group formed that Astana thought was dangerous, and Lance Armstrong and Rinaldo Nocentini bridged up, encouraging an escape by Jens Voigt, Franco Pellizotti, Pierrick Fedrigo, and Leonardo "L." Duque. This break collected the sprint points in Sarrancolin, with Col d'Aspin looming ahead. On the Col d'Aspin, Duque was shed by the leaders, and a 2nd group tried to escape the field. In it were Jurgen Van Broeck, Laurens Ten Dam, Sergio Paulinho, Egoi Martinez, Amets Txurruka, Juan Manual Garate, and David Moncoutie. The gap from Pellizotti's group to the field was 3:17 at the summit, with Nocentini riding comfortably at the head of the pack. Pellizotti attacked his breakmates early on the Tourmalet, and Jen Voigt couldn't match the pace, and began slowly falling back through the chase groups. Maxime Bouet of Agritubel tried to go the other way, briefly bridging to Martinez and Moncoutie's group, but quickly fell away, riding for many miles alone. Atop the Tourmalet, the field came through about 4:49 behind Fedrigo and Pellizotti. On the run-in to Tarbes, Pellizotti and Fedrigo rotated smoothly, and it looked like the win had to go to one of them, with the break much closer to the field than the breakaway. Then, Columbia picked up the pace, and the breakaway was quickly recaptured. Caisse d'Epargne and Rabobank joined in, and the gap started to fall. At 10k, it was down to 1:22; at 5k, just :44. Fedrigo and Pellizottie refused to play cat-and-mouse games, continuing to share the work and looking more and more like they would hold off the field. Entering the final k, the gap was 36 seconds, and Pellizotti refused to come through and take a pull, sitting on Fedrigo's wheel. Fedrigo continued to work, and they rode on until Pellizotti launched toward the last turn in the stage, a 90-degree righthander just 200 meters from the line. Pellizotti was first to the corner, but when they came around, it was into a stiff headwind, and Fedrigo found himself sheltered, and came hard to the line, to take the 3rd French stage win of the 2009 Tour. 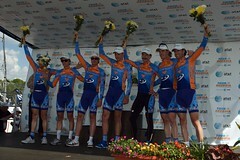 Rabobank's Oscar Freire won the field sprint 34 seconds back, at the front of a group that included all the overall contenders for Tour victory. John Wilcockson dismisses the Tour hopes of Carlos Sastre, in an article explaining how race ornanizers have taken the sting out of the Pyrenean stages by adding long descents (which encourage regrouping) after the marquee climbs. To me, It seems like this works to Sastre's advantage, since, if he survives Stage 9 on Sunday, he's got almost a week to find his best legs before the stage through the Vosges on Friday. It also complicates Alberto Contador's efforts. His best opportunity to make time is an uphill finish, and there are just two left: Verbier on Stage 15 and Ventoux on Stage 20. I think that's the main reason Contador decided to go on Stage 7, because he doesn't want to be in a position where everything rides on the Ventoux climb. With Pereiro's exit from the race today, it will be interesting to see if Caisse d'Epargne turns to Stage 8 winner Luis Leon Sanchez, who sits 11th at 2:16, or if they hunt stages. originally uploaded by vivid tangerine. Working through the Tour de France tag on Flickr, I found this nice shot of Lance Armstrong back in the Stage 1 time trial in Monaco. Cadel Evans went almost from the gun, joined by David Zabriskie, Vladimir Efimkin, Fabian Cancellara. With Mark Cavendish dropped on the climb to Port l'Envalira, Thor Hushovd would join this group with an eye toward the intermediate sprints. Kern currently leads the King of the Mountains competition. With the advantage vanishing on the descent, Juan Antonio Flecha attacked to shed marked men Evans and Martinez. Soon after, Evans, Zabriskie, Kern, and Martinez would be recaptured, leaving 6 riders out in front: Cancellara, Flecha, Casar, Efimkin, Hincapie, and Hushovd. Hincapie led on the approach to the intermediate sprint in Luzenac, but Hushovd attacked and took 6 pounts as first man through. After Luzenac, a number of riders bridged to the leaders, including Mikel Astarloza. Luis Leon Sanchez, Sebastien Rosseler, and Mikhail Ignatiev, so with around 100k/63 miles to ride, 10 riders had about :40 on the field. Hushovd moved to 11 points clear of Mark Cavendish in the green jersey competition. As the 10 leaders began the climb of the Col de Port, they had about 2:20 on the main field, moving slowly enough that the sprinters' group rejoined from behind. With 90k ridden, Oscar Pereiro of Caisse d'Epargne pulled out of the race. 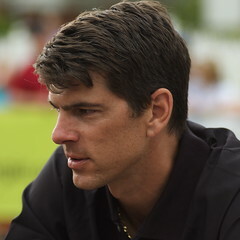 Pereiro was awarded the 2006 Tour title when Floyd Landis was disqualified for illegal testosterone levels. In the last few kms to the summit of the Col de Port, Hushovd fell out of the break, followed by Rosseler. The remaining 8: Cancellara, Flecha, Casar, Ignatiev, Sanchez, Hincapie, Efimkin, and Astarloza. Rosseler would rejoin the break in time for the climb to the Col d'Agnes, but Hushovd's day in front was over. On teh day's final climb, the time gap began shrinking, falling below 2 minutes with around 60 kilometers/37 miles to ride. The Col d'Agnes shook things up, as Andy Schleck launched an attack low on the climb, dropping Nocentini and whittling the contenders group down to around 15. Ultimately, the two groups reintegrated, but only after sweeping up a few of the earlier breakaway. Those results guarantee that Christophe Kern will be the new King of the Mountains tonight, deposing Brice Feillu. 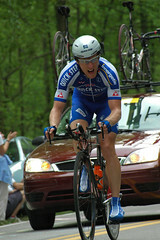 On the descent, Casar quickly rejoined the three stage leaders, while George Hincapie attempted to do likewise. After a few kilometers, Hincapie sat up and left just Astarloza, Casar, Efimkin, and Sanchez leading the stage. The first attack in the breakaway came at 5k to go, as Mikel Astarloza, who has never won a single day event (a stage or one-day race), tried to get free. He was countered immediately by Sandy Casar, but Sanchez had to pull across a small gap with Efimkin on his wheel. As they caught up, Efimkin went hard up the left-hand side of the road, and took about a 5 second lead. Efimkin's timing was perfect. The chasers didn't want to do the work to tow their breakmates up to Efimkin, only to lose a sprint, but they soon got together and, with Astarloza doing the majority of the chasing, the slowly reeled Efimkin back. The final catch didn't come until the last kilometer, with Sanchez leading the catch. Casar chose that moment to go all-out to the line, but Sanchez was alert and covered Casar, then beat him to the finish line for the stage win. The peloton, with Rinaldo Nocentini in place, rolled in at 1:54. We've seen the TT specialists, the sprinters and punchers, and even the breakaway boys have had their stage in this year's Tour. Sitting in the field through all this, conserving their energy and trying not to tip their hand, have been two groups who define the Tour: The climbers and the overall contenders. Today's stage, culminating in the hors categorie Arcalis in Andorra, should be a coming-out party for both groups. The longest climbing stage of the Tour offers the first big climbs of the race, and a finish at 2200 meters, one of 3 mountaintop finishes in this yeear's Tour. The race profile this year offers fewer mountaintop finishes than in recent years, and fewer time trial miles. The effect of the change is to amplify stages like today's where riders can build time gaps. Racers will cover 5 categorized climbs, with a 1st Category 127 kilometers in, and the Arcalis, which is officially 10.6 kilometers or about 7 miles, where we'll find out a lot more about who has brought their climbing legs among the overall contenders. Today's stage is 181.5 miles/112.8 miles, from Girona, where many US cyclists have been based in Europe, to Barcelona. With Robert Gesink's broken wrist, 177 riders took the start, in rainy conditions. Two 3rd Category climbs are the first on the Tour, so there's a good chance that Jussi Veikkanen's time in the polka-dots will come to an end. There's a bit of a sting in the tail to today's stage, with the final categorized climb (if only a 4th Category) at 22 kilometers/13 miles to ride. There's also a 500-meter springboard at 2 k to ride that might play a role. A 3-man break formed with Garmin-Slipstream's David Millar, Quick Step's Sylvain Chavanel, and Cofidis' Stéphane Auge. These guys are all leaders on their squads, if not necessarily their team's Tour captain. As the peloton neared the top of the race's first 3rd Category climb, Euskaltel-Euskadi's Amets Txurruka, last year's overall most aggressive rider for the Tour, went off the front of the main field. 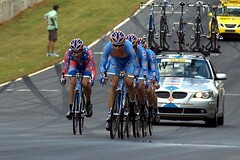 Astana has moved to the front on the descent, and Txurruka continued to attempt to bridge to the escape. On the 3rd Category Collsacreu, Txurruka closed the gap, but Auge, looking to take over the King of the Mountains jersey, drove the trio, and they hit the top a few seconds clear, so Auge should take over the polka-dots tonight. On the descent, Txurruka joined Auge, Chavanel, and Millar, and the gap stretched back out to around 1:45. With 50k/31 miles to ride, the gap is 1:35. As the leading quartet approached the day's last categorized climb with around :50 on the field, a crash on a roundabout took down Columbia's Michael Rogers and Tony Martin, Cervelo's Heinrich Haussler, and Garmin-Slipstream's Tyler Farrar. Rogers was very slow to get back on his bike. At almost the same time, Millar dropped his breakaway companions, and quickly pushed his advantage back out around a minute. Just at 25 minutes to go, Auge and Chavanel were recaptured by the field, but Txurruka continued between Millar and the field. At the summit, Millar led, with Txurruka close behind, and Cofidis sent Remi Pauriol, apparently to keep anyone from picking up ground on Auge in the KoM competition. Over the top, Pauriol continued the attack, and bridged to Txurruka, while Astana controlled the pace in the field. Millar pushed his advantage until it again just touched 1:06, making him the yellow jersey on the road. Pauriol and Txurruka rode :45 back. As the riders rolled into Barcelona, Millar continued to drive it, giving up a few seconds per kilometer. With 11k, he had 1:11. At 7 kilometers, :45. On the run-in, Tom Boonen tangled with a white line (if I had a dollar for every time...), and was out of contention for the day. Milram and Columbia moved to the front, and Millar's lead continued to erode. With 5k, it was :37; at 3k, :23. Just inside 2k, a 6.6 percent grade did the Garmin-Chipotle in. With 1.2 kilometers to ride, he was caught. Cavendish was still in the lead group, but it looked to be Kim Kirchen that Columbia tipped today, with Tony Martin providing the lead-out. Around them, the sport's punchers: those guys with Classics-style power and speed, including Pippo Pozzato, Alessandro Ballan, Gerald Ciolek, Thor Hushovd, and Oscar Freire. Feillu was first to go, tailed by Freire, when Thor Hushovd shot through on the left. Freire and Hushovd drag-raced to the line, with Hushovd getting the win. It was Hushovd's 7th career victory in the Tour, and threatened Cavendish's hold on the green jersey. Adding 35 for the stage win Hushovd holds 105 points, just 1 fewer than Cavendish. Gerald Ciolek sits 3rd. General classification is largely unchanged, although David Millar slipped from 10th to 20th, at 2:28. Thomas Voeckler made his reputation in the 2004 Tour de France. As the best-placed rider in a breakaway (alongside stage winner Stuart O'Grady and TdFblog favorite Magnus Backstedt) that finished 12:33 ahead of the pack, he won and wore the yellow jersey for 10 days. Since then, he's been one of the Tour's most (few?) entertaining Frenchmen, getting in breakaways seemingly every year, and wearing the King of the Mountains jersey in 2005 and 2008. Today, Voeckler got in an aggressively international break from the starting gun, and rode with Russian Mikhail Ignatiev of Katusha, Dutch Skil-Shimano Albert Timmer, FdJeux's Belorussian Yauheni Hutarovich and France's Anthony Geslin, and Polish Lampre Marin Sapa. The break never got crazy gaps, and it looked like it had little chance of success, so the 6 soldiered on. With around 60 kilometers to ride, just after a hard crash by Rabobank's Robert Gesink, strong ocean winds got an assist from Fabian Cancellara, and the peloton split. With no major GC contenders caught out, the field reformed a few kilometers later, but Gesink, accompanied by Joost Posthuma, never caught up. He would gut his way to the finish, only to discover a broken wrist that will keep him from starting Stage 6 (really excellent ANP photo from De Telegraafe here). Several riders described the peloton as “restless,” and a variety of teams took turns at the front, but the pace was never enough to stick a stake through the heart of the escapees. Hutarovich was a threat in the sprint, so Voeckler waited out two testing attacks by Ignatiev, then showed the break his back wheel with a couple kilometers to ride, quickly gaining 10 seconds as the cars were pulled from between the break and the pack. Ignatiev saw the stage going up the road, and tried to bridge to Voeckler, but it was not to be. Voeckler savored the final 500 meters, saluting the crowd and kissing his wedding ring, as the pack thundered toward the line just a few hundred meters behind. Ignatiev just survived the charge, led in by Mark Cavendish, who increased his lead in the green jersey competition. Ben Stiller: Armstrong's Achilles heel? So the other day, Astana signed in late, reportedly because Lance Armstrong was hanging out with Ben Stiller, in France with his wife. Astana paid a fine for the late sign in, but Tuesday, Stiller struck again, as the Versus video above demonstrates. With another flat stage on tap Wednesday, you can bet there's one thought on the mind of most of the directeurs sportif in the Tour tonight: How do we beat Cavendish? He's 2-for-2 in the sprint, and neither finish was particularly close. I think one interpretation of Columbia's display on Stage 2 is that their “realistic GC goals” are to win the green jersey, and bunches of stages, like they did at the Tour de Suisse. You can group successful sprinters on a continuum from “pure speed” to ”pure train.” Robbie McEwen may be the current sprinter who is farthest to the “pure speed” end of things. McEwen has often been successful even without a leadout train, by shadowing the guys who have one, and beating them in the final 250 meters. Alessandro Petacchi, on the other hand, is most successful with a long lead-out train that whittles down the field in the last few kilometers, with Petacchi essentially sprinting from the front for many of his wins. Here comes Cavendish and he's got bushels of both kick and train. Columbia has powerful and experienced porters in Mick Rogers, George Hincapie, Mark Renshaw and Tony Martin, and they've got coal to spare for a formidable train. Cavendish himself has shown he's got a maximum speed nobody can match, and even when he's had to go to soon, he's had the stamina to make it to the line. So how to beat the Manx Missile? Since it appears nobody has a kick to match Cavendish, teams are left with two choices. First, disrupt the team's buildup to the line. We've already seen riders trying to get on board the Columbia train, leading to some pushing and shoving, without success. Competing sprinters can't launch their sprint early, because they would have to outsprint Renshaw AND Cavendish. Ocasionally, on a broad run-in, you'll see competing trains, with swirling, snarling tentacles of riders, splitting and joining as the line comes up. I think Milram tried this on Stage 2, leading from about 4k down to 2k to ride, but then Columbia hit the afterburners, and Milram's train disintegrated. We'll see if anybody else gives this a go. A second approach is just not to let the stage come to a sprint. Send breaks early, and send them often. When they get caught (heck, before they get caught), send some more. We've already seen that nobody wants to help Columbia bring back escapes, so make them do it all day. If they won't chase, there's no stage win for Cavendish. Unfortunately for the pack, after the TTT, Astana would now probably help out with the chase duties, to maintain their stranglehold on the GC standings. So what do you think? How can the pros stop the Tour from becoming a Cav-alanche? forum.cyclingnews.com | Keys for Farrar to beat Cavendish at the line? If yesterday's Stage 3 was The Columbia Show, today was Astana Hour. Whatever the situation on the team bus, they worked as a single cohesive unit on the twisties around Montpellier, and built time gaps on many of the Tour's GC threats. Early on, some big names hit the pavement, including Rabobank's Denis Menchov and Lampre's Alessandro Ballan. Four Bbox Bouygues Telecom riders misjudged a bend, and wound up in the rough. Later, Skil-Shimano's Piet Rooijakers broke his arm and left the course, leaving 178 riders in the race. After the stage, many riders complained that the course was too technical for a TTT. “We have bikes worth 10,000 Euro, and in the end we can't use them properly because we're just busy trying to hold balance instead of putting our power on the pedals." Cadel Evans, who has made a point in the press how much more relaxed he is in this year's Tour, sprinted away from his squad as they approached the finish, leaving his teammates struggling to the line in 49:05, which would be 13th best on the day. Garmin lost 4 riders in the first 12k, but were left with their five best TT men, who set new best times at the final three intermediate checkpoints, and finished in 46:29. Saxo Bank, with yellow jersey Fabian Cancellara doing long, draft-horse quality pulls, turned in a very strong 47:09. Columbia, possibly feeling the effects of that 30k race to the line on Stage 3, came in with a respectable 47:28, but trailed Garmin, Liquigas, and Saxo Bank at every intermediate check. And then there was Astana. Leading the team competition, they were last to start, and they rotated smoothly with big pulls from Klöden, Leipheimer, Contador, and Armstrong. At the first time check, they were a little slower than Caisse d'Epargne, which had kicked the day off with a jackrabbit start they couldn't maintain, but Astana led at every later checkpoint. Once Saxo Bank finished, everyone was looking toward 46:29, the time that would put 7-time Tour champion Lance Armstrong back into yellow. In the last few k, it became clear it would be pretty close. In the final k, it looked very close. In the last meters, it looked insanely, ridiculously close, until Astana came through in … 46:29. The Tour's offical website put Armstrong into yellow (and I followed suit), but not so fast. That 46:29 put Cancellara and Armstrong in a tie, so officials looked at the fractions of a second in Stage 1, and found that Cancellara had held the race lead by .22 second. Officially, the leaderboard shows Cancellara first, with Armstrong second “at :00.” There was a suggestion (notably from Robbie McEwen via Twitter) that Armstrong sat up to leave Cancellara in yellow; I've watched it a couple of times, and can't see why you would go that hard to the line if you were that close to taking a yellow jersey you didn't want. Of note: Liquigas was 4th, a big boost for Roman Kreuziger; my apologies to the Euskaltels, who were middle of the pack, finishing 10th at 2:09. Sastre ends the day 29th at 2:44, Evans 35th at 2:59, Pereiro 40th at 3:03. Menchov, who looked invincible in May, is in 72nd, 3:52 back. This is the third Tour de France I've Twittered. In 2007, it was pretty lonely. Last year, we had a core group of fans using the service. This year, Twitter has exploded. Lance Armstrong has been one of the top celebrities to adopt Twitter, alongside Stephen Fry, Ashton Kutcher (I almost typed “Astana Kutcher”), and Barack Obama. I've developed quite a list of riders, journalists, bloggers, and photographers in preparation for the Tour, and thought I would share it with you. I started with Carlton Reid's massive, 600+ strong list of “Bike Trade Tweeps”. As I've found more, I've been adding them. I left off a few that appear inactive, like @carlossastre, who has nearly 4,000 followers awaiting his first tweet (what pressure! ); likewise Denis Menchov and Robert Gesink, and a few fakes. Also, these are all in English. Please send me additions, either on Twitter (@TdFblog) or by commenting this post. Thanks! There's one Tour plotline that's playing out right in front of our eyes on Versus every day that may not be noticed by many viewers. Lance Armstrong is being interviewed by Frankie Andreu. Andreu, an ex-pro and ex-teammate of Armstrong's at US Postal (through 2000), does almost all the Versus rider interviews, but he and Armstrong have sparred in the media and in court over allegations by Andreu's wife that when Lance Armstrong was undergoing treatment for cancer, he admitted to a history using a variety of performance-enhancing drugs (NPR story, Armstrong's response). Armstrong maintained that Betsy Andreu might have misunderstood a discussion with his doctors, and denied (and has consistently denied) that he ever took any banned drugs. This accusation is also a big part of the feud Armstrong has had with Greg LeMond, who claims to have heard from another woman who was in the hospital room that day that Armstrong admitted to using banned substances. Stephanie McIlvain has maintained in court that she was in the room, did NOT hear Armstrong make any such admissions, and she has refused to speak to the press about the case. Armstrong, who won the case for which Andreu was subpoenaed, has seemed personable with Andreu on air so far this year. Anyone with further insight? forums.cyclingnews.com | Lance speaking to Frankie Andreu? One of the expected early-Tour showdowns unfolds today in Montpellier. 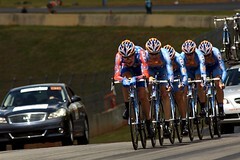 As with Stage 1, the 2009 team time trial is being run over a shorter distance than normal, 39 kilometers or about 24 miles. The shorter distance helps equalize for the elimination of the tiered time limits, which kept the weaker TT teams (cough, Euskaltel, cough) from falling hours behind on a 90-minute ride. The leading riders on a team all receive the time of the 5th rider across the line. The course twists and turns with some rolling country hills and some city streets, and the possibility of more stiff winds like we saw yesterday. This kind of course should favor smart and smooth teams over pure power. Three time checks, at 9, 19.5 and 26.5 kilometers. A number of GC contenders aren't looking forward to today's stage. Carlos Sastre's Cervelo Test Team is pretty thin, as is Silence-Lotto, riding for Cadel Evans. Three teams stand out here, and each has US connections. Garmin has a very strong TT squad (Zabriskie, Millar, Wiggins, Hesjedal, Vande Velde), which came 2nd at the short TTT in the Giro this year, and won the 2008 Giro TTT (putting Christian Vande Velde in the Giro lead) and a very up-and-down TTT at the 2008 Tour de Georgia. They've spent a lot of time on the discipline, they bring 5 strong TT riders, and this may be their single best chance at a stage victory in this Tour. Columbia was the team that beat Garmin in the Giro this year, but at least two of their TT studs spent a lot of time driving the break yesterday. Columbia-HTC has the minor advantage of being totally invincible, seemingly winning everything everywhere the last month or so. They also could grab another leader's jersey, by beating Saxo Bank (and double TT world champion Fabian Cancellara) by :33 and keeping Astana and Garmin close, which would put their Tony Martin (already in white) in yellow, as well. Finally, Astana is a psychic successor to the Postal Service, which won the last TTT in the Tour, back in 2005, on the way to Armstrong's 7th Tour victory. If they could put 40 seconds into Saxo Bank and 30 seconds into Columbia without giving up 30 seconds to Garmin, they could put Lance Armstrong into the maillot jaune. Caisse d'Epargne rolls first, at 8:30 Eastern. Garmin-Slipstream departs at 10:22 Eastern, Saxo Bank 10:29, Columbia 10:36, and Astana last at 10:43. Sony Pictures has long been working on a film adaptation of Lance Armstrong's book It's Not About the Bike: My Journey Back to Life. That's the movie that rumors linked to Matt Damon in the Armstrong role. Armstrong's return to racing this year has the company working on a documentary focused on the comeback. Producing the new documentary is Frank Marshall (who produced the Bourne, Indiana Jones, and Back to the Future series). Columbia-HTC showed off Mark Cavendish's new green jersey on Monday, shelling most of the race's GC men with a powerful 20-mile effort that culminated in a 2nd straight victory for Cavendish. Early on, the stage showed all the cliché elements of the early-Tour sprinters’ stage. A four-man breakaway featuring two French riders was allowed to take more than 12 minutes out of a field that didn't want to chase. Samuel Dumoulin would end the day with the “most agressive” red race numbers for his hours in service to this break and 4th place at the finish. Finally, with 50 miles/80 kilometers to go, the field started slowly reeling in the break. With the expectation of a sprint finish and the prospect of a difficult team time trial tomorrow, few teams were willing to cooperate with Columbia, which was heavily favored to take the stage. It looked like a formula chase, with the capture to come in the final 10 kilometers, unfolding to another sprint showdown. But steaming along the Mediterranean coast in the Camargue, the winds can be stiff, and with about 20 miles to ride, a crosswind forced a gap near the head of the peloton. Ahead of the break was the entire Columbia squad, which hit full gas to widen the breach. Michael Rogers said after the stage he asked his teammates to give “5 kilometers as hard as they could,” and by that point, Carlos Sastre, Denis Menchov, Frank and Andy Schleck, and Alberto Contador were almost 30 seconds off the pace. Not so Lance Armstrong. Armstrong found himself with 26 other riders ahead of the split, with longtime teammate George Hincapie and current teammates Yaroslav Popovych and Haimar Zubeldia. Also in the lead group was yellow jersey Fabian Cancellara, whose Saxo Bank team initially chased, then seemed satisfied to hold the Columbia bunch at around 30 seconds. When it was time to deliver the goods, Thor Hushovd kept it close, but Cavendish found that green suits him, and took his second straight stage win. Matching last year's four wins looks in reach for Columbia's sprinter, and he may not have enough top tube for all the “kill” decals he's going to need on that frame. The field rolled through 41 seconds behind the escape, and the contenders who were caught out commented to a man that this is a three-week race, and that a small gap on the road like this won't make a difference in the overall. We'll know in 3 weeks. So Columbia, like Nuke LaLoosh, has announced its presence with authority. To show for a ton of effort, they have a second stage win, and the white jersey, which moves over to Tony Martin, after Roman Kreuziger was also caught out. We'll see tomorrow what those cost them. 3) Cyril Lemoine, Skil-Shimano, s.t. 4) Samuel Dumoulin, Cofidis, s.t. 5) Jerome Pineau, Quick Step, s.t. 6) Fabian Cancellara, Saxo Bank, s.t. 7) Fabian Wegmann, Milram, s.t. 8) Fumiyuki Beppu, Skil-Shimano, s.t. 9) Maxime Bouet, Agritubel, s.t. 10) Linus Gerdemann, Milram, s.t. Jussi Veikkanen holds the polka-dots of the King of the Mountains, Martin takes over the white jersey, Cavendish holds green, and Astana hangs onto the team classification lead. 2009 Tour de France - Stage Two - How The Race Was Won from Cosmo Catalano on Vimeo. Sit back and let your Uncle Cosmo show you some of the things you may have missed on yesterday's Stage 2. Cosmo's done a few of these before — you can find them on his Vimeo channel or over at his weblog, Cyclocosm. Quick Step's Jurgen Van De Walle will not take the start at Stage 3 tomorrow. He crashed hard during Sunday's Stage 2, and a post-stage examination in Marseilles found a punctured right lung and fractured left collarbone. Van De Walle, who has been a regular on Quick Step squads racing at the Tour of California and Tour of Georgia, finished back in the field today, and sat in 79th place in the Tour. Barring any other withdrawals, 179 riders will continue the race tomorrow. Tour officials refused to let defending champion Carlos Sastre race today's Stage 1 in Monaco in the yellow jersey. For years, defending champions could choose to wear the yellow jersey during the subsequent Tour's first stage. Lance Armstrong sometimes did (2003), and sometimes didn't (2004, 2005). Since Armstrong's retirement, there was no returning champion in 2006 (Armstrong retired), 2007 (Landis banned, Pereiro not yet named champion), or 2008 (Contador and the rest of Astana barred from racing). Sastre has been the Rodney Dangerfield of GC candidates, and would probably have liked to remind teams and fans that he was good enough to win this race last year, but the ASO decided the tradition had run its course. Armstrong's 2003 prologue start looks to stand as the last initial Tour stage with a rider in yellow. Well, we're certainly going to kick things off with a bang. Today's course is both longer and harder than a Tour prologue, with about a 5-mile/7.5-km incline on the front end, and some technical bits on the back end. The climb to 205 meters is officially a 4th Category climb, so we'll get a King of the Mountains for tomorrow, as well. To claim the race's first yellow jersey, riders will need to put out the power to get up that rise, without going anaerobic, or they'll find themselves losing time on the flatter, power-friendly final 4 kilometers. You can't run a Tour time trial without anointing Fabian Cancellara the favorite, but it takes a lot of watts to drive Cancellara uphill, so maybe he'll leave an opening for another rider. TTs with climbing tend to reveal the GC threats, so Alberto Contador's got to factor in. Bradley Wiggins has made his career out of shorter TTs, so keep an eye on him, as well. I'll be pulling for David Zabriskie, whose climbing has improved tremendously in the last 4 years, sometimes to the detriment of his TT'ing; here, that could make for a competitive combination. And it's not a given that everybody lines up as expected. In 1989, defending Tour champion Pedro Delgado missed his prologue start time, finally leaving the starthouse 3 minutes behind schedule. In 2004, current Garmin-Slipstream director Matt White, then a Cofidis rider, broke his collarbone in a spill while warming up on the morning of the prologue, and had to be replaced by Peter Farazijn. If you're interested in the Tour de France, but you don't really get what's going on all the time, this is the post for you. 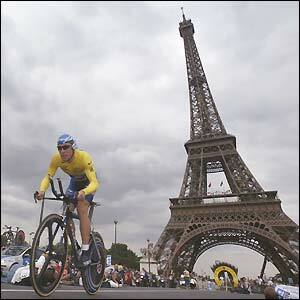 The Tour de France is the biggest event in bicycle racing. It's a three-week race, starting on the first Saturday in July, that includes about 20 daily stages, and two rest days. There are two other 3-week Grand Tours in cycling, the Vuelta á España in September, and the Giro d'Italia in May, but the Tour draws more fan and sponsorship interest than either of those. Even though an individual wins a bicycle race, the sport is really contested by teams. Having a team to shelter the leader, from the wind, from mechanicals, and from having to chase every attack up the road, can make all the difference in a team leader's chances. One of the things that makes a stage race unique in sports is the variety of different contests going on at the same time. Twenty teams and 180 riders will take the start today in Monaco, but only one will take the overall victory, and many teams have only faint hopes of even competing for the overall. Recognizing that, Grand Tour organizers run a number of different competitions within their races. Most obviously, there's a stage winner each day. Usually, that's simply the rider who crosses the stage's finish line first. In a time trial, riders make a staggered start over a set course, with the rider who finishes in the least time declared the winner. In the team time trial (this year, that's Tuesday's Stage 4), the winner will be the team whose 5th rider crosses the finish line in the least time. Why 5th? 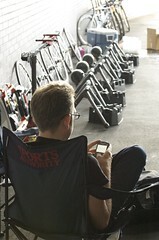 To discourage teams from resting riders or sheltering them from the maximum effort of the team time trial. Winning a Tour stage is a highlight of many riders' careers. Only 10 Americans have ever won Tour stages, from Jeff Pierce back in 1987 to Levi Leipheimer in 2007. Lance Armstrong has 25 career stage wins. Each day, race officials also name a “most agressive rider”. This should be a rider who shook things up on the stage, by riding away from the main group of riders (called the “peloton” for “ball of wool”) or, often, a French rider who participated in a breakaway group. That rider gets special red race numbers (a “dossard” in French) to wear during the next stage. At the end of the overall race, a rider is named “most agressive” for the Tour. There are also 5 parallel competitions being contested through the entire Tour. The most famous is the yellow jersey (maillot jaune), or overall leader's jersey. The rider with the lowest elaspsed time over all the stages run is awarded a yellow jersey to wear during the next stage. Sometimes, a rider is referred to as the “yellow jersey on the road” – that means that this rider is the best placed rider in a breakaway group that leads the previous race leader by more time than that rider's previous deficit. In other words, if conditions held as they are, that rider would take over the race lead. Five Americans have worn the yellow jersey at some point during the race: Greg Lemond, Lance Armstrong, George Hincapie, Dave Zabriskie, and Floyd Landis. Note that there's no requirement for a yellow jersey to have won a stage. If he can make the lowest overall time by staying close to stage winners, that's good enough, and Greg Lemond, among others, won a Tour without winning a single stage. Yellow jersey candidates must be good in the mountains and on the Tour's time trials, the two venues that create most of the time gaps between riders. Probably the next most prestigious is the green jersey, which is awarded to the rider who amasses the most points at sprint lines throughout the course. Many teams carry specialist sprinters, sometimes with one or more “lead-out men,” who are fairly strong sprinters themselves, and give their all to put a teammate at the front of a bunch in the last 200-300 meters of a stage. Points are awarded for the top finishers in flat stages, with the stage winner taking maximum points, and a sliding point scale that may go 20 riders deep. There are also intermediate sprints in the middle of many stages, which work the same way. The first rider to the sprint line receives maximum points, decreasing by place down to one point. Last year, the green jersey was won by Oscar Freire of Rabobank, but this year, 2007 winner Tom Boonen and Columbia phenom Mark Cavendish look like more likely candidates. The King of the Mountains jersey is white with red polka-dots. Riders receive points for being among the first to reach mountain summits on the Tour's mountain stages. Again, the first rider to the summit receives maximum points, tapering to 1 point, with more points on climbs deemed hors categorie, or “beyond classification,” and fewer at lower categorized (in decreasing order: HC, 1st, 2nd, 3rd, 4th Category) climbs. The white jersey goes to the rider under 25 who is highest placed in the overall standings. Last year, Saxo Bank's Andy Schleck won the white jersey competition, and he's a candidate for the overall win, and to repeat in the white jersey. Finally, each day, organizers total the times of each team's first three finishers, and the team with the lowest overall total leads the Team Classification. Note that each day can feature different riders, but the first three from that team are totalled for this competition. The leading team each day is awarded race numbers with a yellow background, instead of the usual white. Unofficially, fans also track the overall last-placed rider in the Tour, who is called the lanterne rouge in comparison with the red lantern that used to hang from the caboose of a train. Wim Vansevenant of Silence-Lotto was the Tour's lanterne rouge a record three times consecutively from 2006 through 2008, but retired after last season, making room for a new red lantern. It's the ad hoc alliances and shifting rider and team strategies that make a stage race fascinating. The existence of all these competitions and stages makes for many alliances on the road. Different teams have different Tour objectives, and so adopt different strategies. During the flatter stages, teams with outstanding sprinters like Tom Boonen, Mark Cavendish, and Thor Hushovd, are likely to work to reel in any breakaway, setting up a sprint finish that favors their fast men. As the race progresses, responsibility for chasing down breakaways typically falls to the team of the leader, or sometimes to teams who will see a rider in the breakaway as a threat to their well-placed riders. Late in the Tour, for instance, a team with a 3rd-place rider will tear its lungs out to keep the 4th-place rider from getting up the road, and endangering their man's podium placing. Teams without good prospects in the overall will find other goals: Stages that might favor their best climber, breaks where they can get a disproportionate number of riders from their own team, or a chance to launch a climbing specialist on a day-long solo expedition, where he can collect a jerseyful of King of the Mountain points. The rate of success in a breakaway is low, but it's better than that for a rider in the peloton. If you get a rider in a 5-man break, you've got a one-in-five chance if the break succeeds, while you've got a one-in-twenty (20 teams riding this year) chance in the pack. This is the original version of my “Beginner's Guide,” with answers to a lot of questions from readers. If you're new to the site, welcome! If you're back, thanks! When I started TdFblog, back in 2003, there wasn't a lot of cycling coverage on the web. CyclingNews and VeloNews already had websites, but neither had much audio or video, and VeloNews didn't really create much content beyond what went in the magazine for the web. I started posting links to other bloggers, and to news sources that the average fan might not easily find, from the AP photo wire, BBC, and original sources not in English, like L'Equipe and AS. Today, there are dozens of great bicycle sites, many of them focused on racing. Why come here? I hope to help English-speaking fans, who may only watch the Tour (and especially with Armstrong's return this year), gain an appreciation for the beauty and savagery of our sport. During the Tour, I'll link to dozens of stories in the main content column here, and hundreds more in the “Tour Posts at Other Sites" section of my left sidebar. I'm not picking those because they're from my content partners, or because they're part of my site -- the things I link are the things I like, whether I agree with them or not. I hope you'll like them, too. The explosion of interest in the Tour and in outlets covering the Tour means it gets harder every year to find all the great Tour content out there, so I welcome (nay, beg for) your help. If you see something you think TdFblog readers would like to know about, please send it along. And, if you're on Twitter, feel free to reply or to direct-message me (I'm @TdFblog) with content or comments. The Twitter feed will be the only place for my as-it-happens race updates, and I'll usually post links to content there before I post stories about that content to the site. If you've got to know everything first, you'll want to follow the Twitter feed. I think it's important to attribute links, so I'll usually add a “via” on Twitters and always try to at least abbreviate the news source I'm citing. “CN” is CyclingNews.com, “VN” is VeloNews, “CW” is Cycling Weekly, “Euro” is Eurosport. I'm using #tdf as my Tour hashtag; I prefer it to #tourdefrance since it saves 9 precious characters in a 140-character post. I'll probably use the #22 tag for Armstrong (that's his race number), and may adopt that convention for other riders, as well. That's also why I use the tr.im URL shortener -- when you see a link to “tr.im” in my Twitter stream, it's a shortened version of a link like http://www.cyclingnews.com/news/ cavendish-aims-for-stages-and-paris — that's 67 characters by itself! Feel free to retweet anything I've posted to Twitter. When I post a photo on the site, clicking on it will always take you to a larger version in its original location. In the sidebar, I do that instead of attributing the photos in the limited sidebar space. If there's an uncredited photo in the main content column, it's probably one of mine: You can see many of my cycling photos on Flickr. The French Olympic Committee's Court of Arbitration for Sport ruled today that Belgian sprinter Tom Boonen may start the 2009 Tour de France. Boonen, who tested positive for cocaine in an out-of-competition test in April, had been barred from racing this year's Tour by ASO, the Tour's owner and organizer. It was his third positive for the drug since November 2007, and led ASO to bar him from last year's Tour, as well. Australia's Allan Davis had been announced as Boonen's replacement at the Tour. Boonen, one of the sport's best sprinters, should make the fight for the green jersey much more interesting, and his presence could deny Mark Cavendish a chance at bettering his four stage wins from 2008. The 2005 world champion and 2007 Tour green jersey, Boonen claimed his first Belgian national championship last weekend. This month, Sundance Channel is showing a documentary by Nick Davis on the 2008 campaign by Garmin-Chipotle. It focuses on Magnus Backstedt, Mike Friedman, David Millar, and Christian Vande Velde, as they prepare for their season goals. The rider selection is interesting, showing the breadth of the team (Friedman is a track specialist, Backstedt best in classics), but maybe shortchanging the development of the Tour team as a result (If the team's Giro is mentioned, I don't remember it). The only road races in the film are the Tour of Qatar, Tour of California, Paris-Roubaix, and the Tour de France. And I would have enjoyed more Zabriskie. Still, if you're a fan of the Tour, and especially if you're a Garmin fan, you need to check it out. The show's scheduled to run 6 more times this month, with the next showing Saturday night at 8 p.m. Eastern. You can see a preview here. originally uploaded by Nationaal Archief. 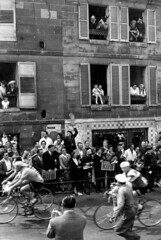 The National Archive of the Netherlands has posted 28 images of past Tours de France. There's inaugural winner Maurice Garin, Eddy Merckx with Joop Zoetemelk in 1973, Anquetil in '63, a podium girl with winner, circa 1928, and 20-something more. These are just 10 kinds of awesome. Take some time, and browse through them slowly. Does Charly Wegelius' mom work for WADA? I'm really sorry to see Thomas Dekker turn up positive. There had been suspicion about him, especially when his team left him off their Tour squad last year based on his blood test results, but along with Robert Gesink, he was one of the big hopes for Dutch cycling. There still remains a possibility that Dekker will be exonerated. The UCI released the news, as has become its custom, after Dekker's “A” sample tested positive. They will now test a 2nd sample collected at the same time, and Dekker faces a ban if that “B” sample also tests positive. If that's the case, they've got him dead to rights, and he deserves the 2-year suspension he would almost certainly face. I wanted to focus on the timing of the announcement, however. This sample is one that was collected in December 2007, and officials retested it because a) they didn't like the looks of Dekker's biological passport numbers for the last two seasons, and b) they have newer tests that can identify more forms of EPO (including CERA, presumably). I can't tell for certain when the followup test was conducted. I seem to remember seeing “May,” but can't find confirmation. So why are we hearing about a test whose results are usually back in around 3 weeks 6 weeks later? It's almost like the anti-doping officials were looking for a reason to send a message in advance of some big event. Also, if you could wait 6 weeks, why not wait until you have the “B” sample results? There may be perfectly valid reasons these results have come out now, just 3 days before the Tour start, but I think testers owe it to fans, teams, and riders to provide some assurances that results will always be reported consistently (and I would prefer waiting for the “B” sample, but consistency is paramount) and expeditiously. Oh, the headline -- Silence-Lotto will be bringing Charly Wegelius to the Tour to fill Dekker's shoes.